Took a ride to East Bay Motocross Track today! Thanks to Mike Parisi and his crew for a great time. It is very clear that everyone has worked very hard to bring Florida another super track to ride on. They are beginning to fill up their race schedules and other events so be sure to check out their website for more info. Don’t forget that East Bay’s Grand Opening is August 14th and 15th. CLICK HERE FOR MORE INFORMATION. Below are sequence shots from a ride around the track today. Check out East Bay Motocross. This is a vid of 2 second sequence shots around the track. It was raining, and overcast, but it gives you an idea of what the track looks like as of 8/7/10. Watch in YouTube for a much larger version or full screen. East Bay Motocross Coming Together! They are working with Jason Baker from Dream Traxx to build a great track design. They are hoping to open this summer! According to Mike Parisi from East Bay Motocross “We are also going to offer a “Vendor Book” to all our members. Our vendors will have the opportunity to offer “specials” to EBMX members with products and pricing discounts.” “If you visit our website we are offering a “free ride pass”, getting people registered for this is our #1 goal.” Click link above to get your “free ride pass” !! 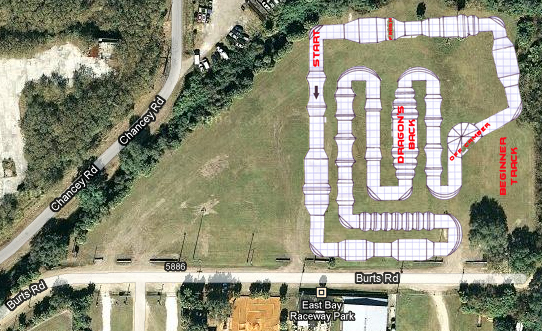 Spread The Word and let’s help in making another track in Florida a success!